The members of Jefferson Starship past and present have been exploring the mysteries of music for more than 1000 collective years. Give or take. But who’s counting? Jefferson Airplane founding member Paul Kantner created Jefferson Starship with that collective spirit in mind and carried it with him throughout his life. Kantner knew that combining powerful creative forces, personalities and talents could create something far great- er than the sum of its parts. Between 1974 and 1984, Jefferson Starship released eight gold and platinum selling albums, twenty hit singles, sold out concerts worldwide and lived out legendary rock and roll escapades. 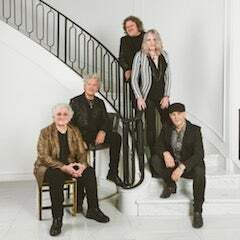 Ciao Med Spa presents today’s Jefferson Starship, who remains dedicated to breathing new life into the living catalog of the Jefferson legacy, going to the edge, pushing the sonic boundaries and staying true to the original spirit of the music, on and off stage. Times have changed, but the music remains as relevant as ever. Massive hits like White Rabbit, Somebody to Love, Volunteers, and We Built This City continue to reverberate in pop culture today.